Matt and I headed to a practice space, Jamspot, with a Pelican case full of of mics, headphones, USB cords and a White Pages sized copy of Essential Ant-Man. Why that book? It was a couple of weeks before Paul Rudd brought Scott Lang to the big screen and Stan had himself another “Crazy, Stupid Fine” cameo in the Marvel Cinematic Universe. This was a great day, Stan addressed me with “Hiya, Clay” before I needed to ditch my whole podcasting setup because it was hard for Max and Stan to hear what we were talking about. 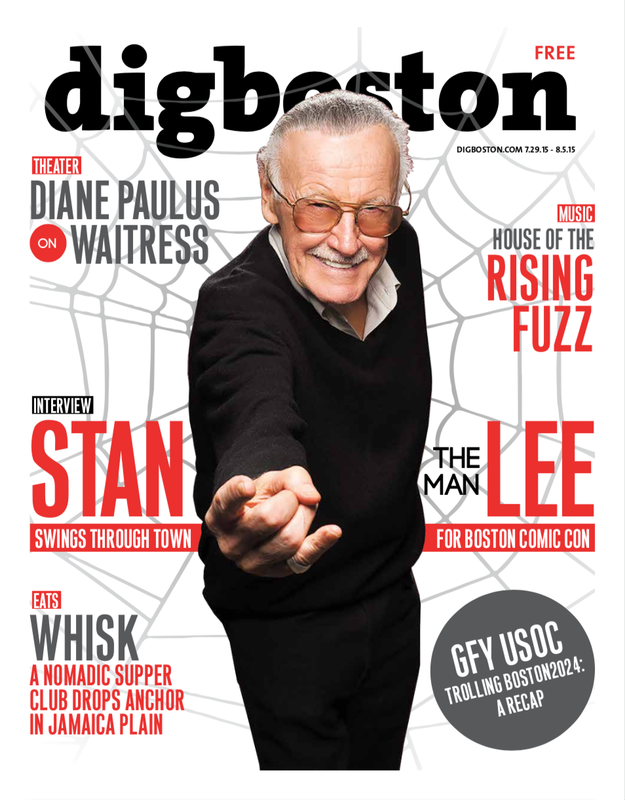 The transcription of this phone call wouldn’t be suitable for release as a podcast (or else I would), but did serve well enough for me to transcribe what you found over at DigBoston.com in July of 2015 to preview that year’s Boston Comic Con (Now, Fan Expo: Boston). Tak’s cover is amazing, with Spidey’s webs covering Stan, and I got my hands on the PDF of the cover and printed it on 11 x 17 card stock. When I cut the line to the VIP (sorry, but I don’t feel bad!) Stan was feeling a bit under the weather but we fist-bumped (I fist-bumped with the creator of most important punches in my life!) and I was able to say “Thank You” for the interview. He loved the cover so much he asked for a copy. I was holding 6, paranoid something would happen, and also to grab one for Tak. I hope Stan left this world with a smile on his face, his influence on generations of fans is literally incalculable. May Saint Peter greet him with a big ole’ “Hiya, Stan”! 92 years young, Stanley Martin Lieber never did quite get to write that Great American Novel. He did something far more impactful to generations of people: After changing his name to Stan Lee, he created the Marvel Universe. All praise its name. Before I could make out the letters, I could understand fantastic cars whizzing through the sky in the comic books he’s been behind since the Marvel Universe big-banged its way into my life and the ﻿lives of countless other fans.